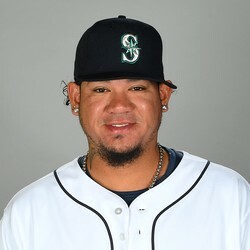 Felix Hernandez allowed four runs on nine hits, one walk, and three strikeouts through six innings pitched on Thursday against the Angels. Hernandez was looking very solid until the 7th inning hit him, he failed to record an out and was taken out while the Mariners bullpen was unable to hold onto the win for him. He's had some decent showing thus far, he's up to a 4.91 ERA, 1.47 WHIP, and 13 strikeouts.